BEWARE OF FRAUDULENT TICKET VENDORS!! ARTSCAPE ONLY USES COMPUTICKET FOR TICKET SALES. The gifted classical music singers Heavenly Quartez have been “hitting all the right notes” (News24.com) and conclude their 10th Anniversary celebrations with a performance on 02 December @ 4pm at Artscape Theatre. They will be accompanied by the Cape Town Philharmonic Orchestra under the baton of Chad Hendricks. Aviva Pelham directs, with Set Design by Michael Mitchell and Lighting Design by Faheem Bardien. Nkumbuzo Nkonyana, Melikhaya Ndabeni, Mawande Mxunyelwa and Sihle Mtitshana joined forces in 2008 whilst attending the Harry Gwala High School in Khayelitsha, combining their powerful operatic singing style with their youthful charm. They haven’t looked back since their first big public performance in 2009. Their scintillating voices complement each other, creating stirring harmonies, while their versatility and energetic stage presence keeps the audience spellbound and wanting more. They have great crossover appeal as is evident from the diverse events at which they perform. Their repertoire is varied, ranging from opera masterpieces to light classics and popular songs, a highlight of which is a multilingual medley featuring Afrikaans, English, Italian and Xhosa. They sing about hope and their aim is to empower those in need of inspiration. 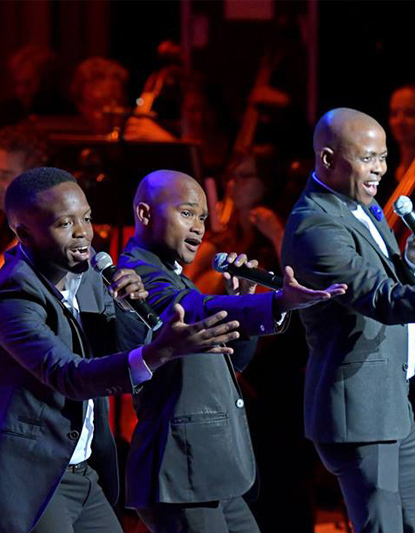 That generosity of spirit lifted the roof when the group performed at the Cape Town Philharmonic’s Debut Gala Concert – A Symphonic Platform for Community Brilliance in February of this year. The underground municipal car park linked to Artscape is open for public parking from 17:00 on weekdays and an hour before the starting time of shows on weekends. It closes at 24:00. The parking fee is R24.00 and R15.00 for pensioners. Limited facilities for wheelchairs areavailable in the Opera House and Theatre in accordance with safety regulations. Wheelchair seats can be booked at the Artscape Box Office, at any Computicket outlet, or through the Computicket call centre. Please note that the Arena is not wheelchair friendly. Toilets for wheelchair-bound patrons aresituated in the Marble and Chandelier Foyers of the Opera House and on the lower level of the Theatre Foyer. Limited parking bays are available for bona fide Disabled Parking Disc Holders in the tunnel area opposite the Stage Door entrance, and in the staff parking area. A drop-off facility is available in the tunnel area for patrons who have difficulty walking. Prior arrangements in all regards should be made with the Theatre Manager.